This entry was posted in Knitting & Crocheting and tagged Cowl, halfmoon nails, Katniss, Knitting, Lace, mint candy apple, Nailpolish, no place like chrome, sand tropez, Socks, turquoise and caicos, turquoise sky, urban turquoise, Yarn Along by kathatravelling. Bookmark the permalink. I’ve been looking for a copy of The Culture of Knitting – it’s really expensive on Amazon. Any ideas where I could buy a copy? I’m in the UK. Well I got a used version from amazon but I just checked and I guess was just extremely lucky to get it that cheap. I bet there are book exchange pages in the UK. Maybe you can try it there? I love the Hunger Games. Thanks for this blog post – it’s lovely! Thank you! Still waiting for the first book to arrive. I’m really eager to find out more about the Hunger Games myself. I’ve never tested knitted anything and have other things going so can’t now but the design looks interesting. I plan on doing my nails similar just different colors. Saw a how to video on YouTube. Hope everything works out with your pattern. Interesting list of reads! 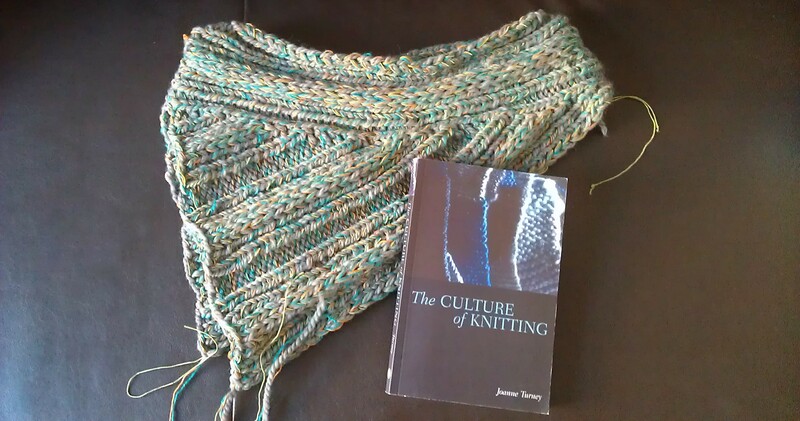 I looked at The Culture of Knitting on Amazon…kinda pricey, but will check the library. You’re inspiring me to really give my designing a kick start! Good for you and I will check in Sunday! Thanks. I got The Culture of Knitting as a second hand version on amazon and like this it was a bargain. The cowl looks great. I love the silver nails. I’ve been thinking about the cowl, since I saw that post too! Glad you took it on! I think we are getting somewhere, this looks incredible! Good God I ♥LOVE♥ the blogging community! Thank you! I’ll try and finish the cowl on the weekend and write down the pattern (but it might include a bit of crocheting at the end…) And don’t worry, you are most definitively welcome to be a test knitter as you were the reason I saw the picture at all. Otherwise I would have never come up with the idea! *CLAPPING! * I cannot wait to give it a go! I posted about this cowl idea last week? Oh I don’t know when, but if you still need test knitter’s I would ♥LOVE♥ to do this. My niece is a huge Katniss fan – which is why I’ve been trying to figure this thing out. Lemme know!! The lace sock is wonderful! I will have to check that cowl out. I haven’t seen any trailers or posters for it yet but I am anxious to see it!